New to Loka? Nice to meet you! 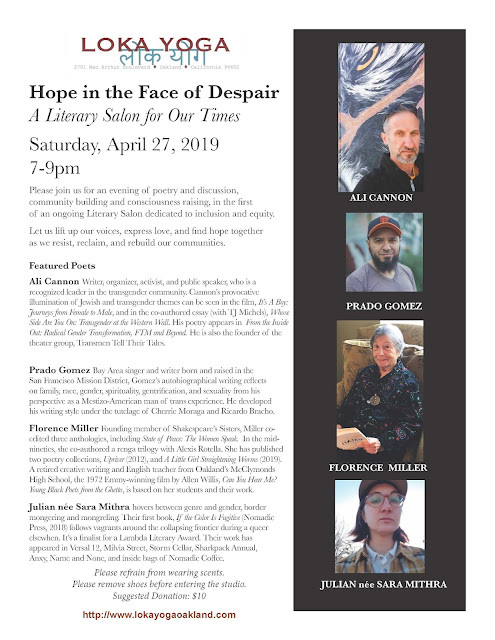 Please join us for an evening of poetry and discussion, community building and consciousness raising, in the first of an ongoing Literary Salon dedicated to inclusion and equity. Let us lift up our voices, express love, and find hope together as we resist, reclaim, and rebuild our communities. Ali Cannon Writer, organizer, activist, and public speaker, who is a recognized leader in the transgender community. Cannon’s provocative illumination of Jewish and transgender themes can be seen in the film, It’s A Boy: Journeys from Female to Male, and in the co-authored essay (with TJ Michels), Whose Side Are You On: Transgender at the Western Wall. His poetry appears in From the Inside Out: Radical Gender Transformation, FTM and Beyond. He is also the founder of the theater group, Transmen Tell Their Tales. San Francisco Mission District, Gomez’s autobiographical writing reflects on family, race, gender, spirituality, gentrification, and sexuality from his perspective as a Mestizo-American man of trans experience. He developed his writing style under the tutelage of Cherrie Moraga and Ricardo Bracho. Florence Miller Founding member of Shakespeare’s Sisters, Miller co- edited three anthologies, including State of Peace: The Women Speak. In the mid- nineties, she co-authored a renga trilogy with Alexis Rotella. She has published two poetry collections, Upriver (2012), and A Little Girl Straightening Worms (2019). A retired creative writing and English teacher from Oakland’s McClymonds High School, the 1972 Emmy-winning film by Allen Willis, Can You Hear Me? Young Black Poets from the Ghetto, is based on her students and their work. Julian née Sara Mithra hovers between genre and gender, border mongering and mongreling. Their first book, If the Color Is Fugitive (Nomadic Press, 2018) follows vagrants around the collapsing frontier during a queer elsewhen. It’s a finalist for a Lambda Literary Award. Their work has appeared in Versal 12, Milvia Street, Storm Cellar, Sharkpack Annual, Anxy, Name and None, and inside bags of Nomadic Coffee. you will be charged a $20 late cancel fee. 7 years ago and completed her 200hr YTT at Niroga Yoga Institue in 2013.
stillness, energetic awareness, and postural correction. jogging extremely slowly, baking bread, and going out to brunch. You have friends who've never been through these doors? and we want to meet your good friends and your neighbors. Now is the time to grow our sweet sangha. We are now offering your loved ones a "Welcome Home to Loka" package where they can come join our party/revolution, meet all of us, sample all of our classes, get physically and mentally stronger, and get some much needed serenity. after the date they make the purchase. new students looking for less of a commitment. 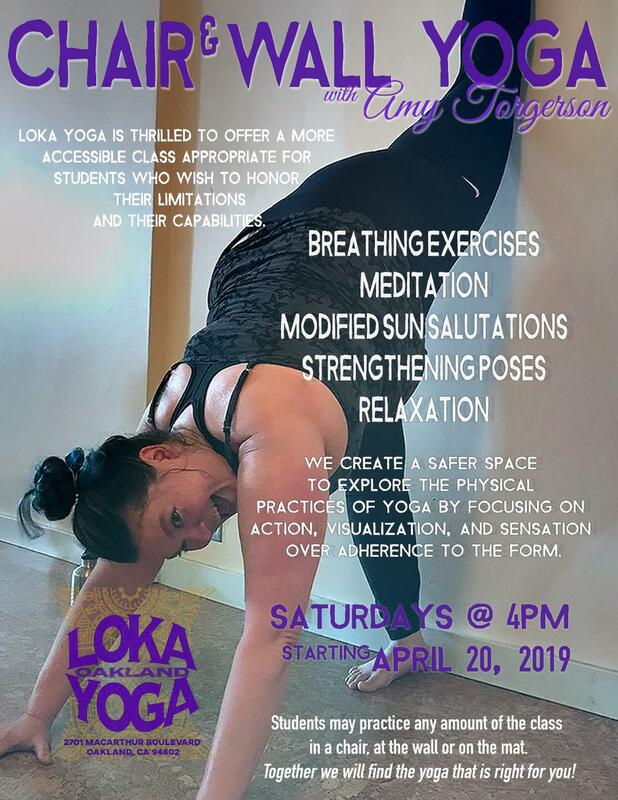 Classes paid for in person by cash or check will be discounted $2 a class.